Comfortable house in a quiet area - fantastic sea view. We rent a comfortably equipped, free-standing house with a quiet location, with big garden and a fantastic sea view. You can reach the sandy beach in 5 minutes by car. A car stays at your disposal during your entire stay. This resort is away from mass tourism. 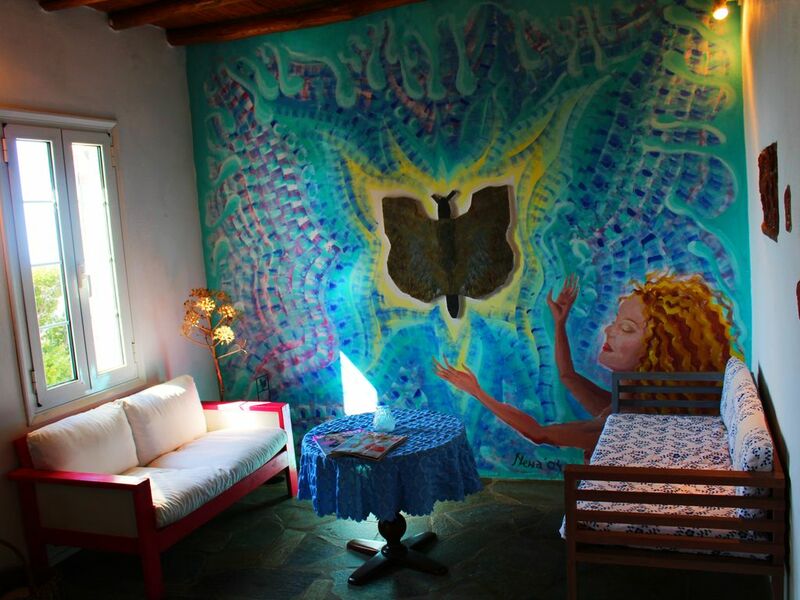 The house is located in the neighbourhood of Agios Petros Tower, and it is a paradise for nature lovers and families. It is a modern cycladic house with 2 bedrooms (each with 2 single beds), living-room with open kitchen-area, bathroom, air condition and covered veranda. From the veranda you have a great view over the plain and the port of Gavrion to the sea. In the evening you can see the lights of Attica. The ceiling with beam and bamboo and the nice natural-stone floor underline the cycladic character of this charming house. The sensual quietness and the fragrance of the nature provide a real vacation atmosphere. Down of the house you find the vineyard and all kind of fruit-trees. Art and culture: The Museum of Art in Andros City offers a large, permanent exhibition, and yearly travelling exhibits by famous artists. The Culture Museum in Andros City informs you about the history of the Andros Island. Authentic Greek life: In Andros you can experience authentic Greek life all day long: in the village, in the taverns, while shopping, etc. I'm Swiss, my husband Adonis was Greek from Andros. Me and my daughter Aphroditi live in Greece and Switzerland. I know the Island very well and can give you many tips about nice places, beautiful beaches and traditionel tavernas. If you have any questions feel free to ask! This paradisiacal spot has been in our family estates for generations, a green oasis in the Aegean Sea, with a breathtaking panorama view. Away from mass tourism. Here you will find peace and relaxation and yet only short distances to beautiful beaches and the cosmopolitan life. The surrounding area and the island are beautiful. Plenty of untouched nature, plenty of sun and unique beaches. No mass tourism and the island is from the Athens airport very easy to reach. This is a well equipped house, ideal for 2 - 5 people. It has air conditioning and heating possibilities, as well as a quiet location, with dream-like view. It has a big garden with olive grove, vines, many fruit trees (you can pick up season fruit for free), springs, wild herbs, a grilling place with pergola and garden furniture. It is 5 minutes from the fantastic sand beach of Agios Petros. A car (Hyundai with air conditioning) is at your disposal for free, during your entire stay. You only have to pay for your fuel. We had a nice stay. Terrace with great view. The owner was there to make sure our stay was perfect. Home linen was changed 3 times within our 2 wk stay. The minuses are we thought the road to the house wasn't that long and moutainous. We had to change the car 3 times. No washing machine. But the internet connection was greatly appreciated. Andros is the second larges from the Cycladian Islands, rather unknown and without mass tourism. It is a green island, with a lot of water, many beaches and emerald blue sea. It is an ideal place for individual vacationers, for silence lovers and for everybody who wants to experience authentic Greek lifestyle. It is a pearl of the Aegean, which can be easily reached from the port of Athena, in 1 - 2 hours by taking the ferry from Rafina. The island is an authentic piece of Greece, and the perfect place for an unforgettable vacation.